The Mormon Church, also known as the Church of Jesus Christ of Latter-day Saints (LDS), denies the doctrine of the Trinity, believes salvation is by grace plus works, that people will become gods and goddesses, also that the true gospel has been perverted and lost, therefore founding “prophet”Joseph Smith was called upon by God to restore the true church. Mormonism is not the true Church of Jesus Christ, as they claim. 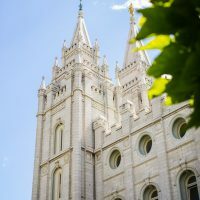 The truth is, Mormonism has a counterfeit gospel.